Description: Join Madeleine Hage for a discussion of books written in French and discussed in French. This month the group is reading Le Lievre de Patagonie by Claude Lanzmann. This book will be discussed for three months at the January, February and March discussions. The Patagonian hare Claude Lanzmann French filmmaker and journalist Claude Lanzmann achieved worldwide acclaim for his nine-and-a-half-hour cinematic epic Shoah. Unlike other films on the subject of the Holocaust, Shoah used only first-hand accounts from perpetrators and survivors of the death camps, as Lanzmann believed that any attempt to reproduce the history would be to relive the genocide. Born in Paris in 1925, Lanzmann survived the German occupation of France, fought with the French Resistance during World War II, and joined Les Temps Modernes, Jean-Paul Sartre's political-literary journal, in 1952. In The Patagonian hare, Lanzmann remembers his extraordinary intellectual, political, and creative career, from the youthful résistant, to the culture and commitments that led him to Sartre, to his love affair with Simone de Beauvoir and the making of Shoah. Parkway Central Library 1901 Vine Street Philadelphia, PA 19103 (between 19th and 20th Streets on the Parkway) This is a TICKETED event; $15 General Admission, $7 Students. For more information, please call 215-567-4341, or click here Tickets on sale January 12, 2012 at 10:00 a.m.
Claude Lanzmann was born to a Jewish family in Paris, France. He is the older brother of Jacques Lanzmann. After the divorce of their parents in 1934, he and his two siblings went to live with their father in Brioude. He attended the Lycée Blaise-Pascal in Clermont-Ferrand before the family went into hiding during the Nazi Occupation of France in World War II. At age 17, he joined the French Resistance and fought in the Auvergne region. After the war, Lanzmann moved to Paris and studied philosophy at the Sorbonne. He wrote for newspapers and magazines such as France-Soir and France Dimanche before becoming the protégé of Jean-Paul Sartre as an editor at Les Temps Modernes. He also became the lover, traveling companion, and confidant of Simone de Beauvoir, with whom he lived from 1952 to 1959. He opposed the French wars in Algeria and Vietnam, and was among the first Western writers to explore Communist East Germany, the USSR, China, and North Korea. He wrote for glossy magazines and interviewed movie stars and celebrities at the height of the French Nouvelle Vague. Eventually, he took on a new career as a documentary filmmaker and a chronicler of the Holocaust, beginning with Pourquoi Israël in 1972. His most renowned work, the landmark film Shoah (1985), is a nine-and-a-half-hour oral history of victims and perpetrators of the Holocaust. His memoir, published in 2009 under the title Le lièvre de Patagonie (The Patagonian Hare), was a bestseller. He has been married three times, and is the father of two children. Claude Lanzmann is currently considered a "single author." If one or more works are by a distinct, homonymous authors, go ahead and split the author. 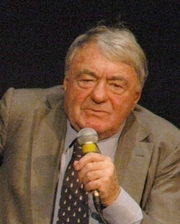 Claude Lanzmann is composed of 5 names. You can examine and separate out names.